Moving along at 4-5 mph might not seem like an impressive feat, but when you're taking a 2-million-pound steel structure upstream, it's a significant accomplishment. That's what happened last week when a $15 million, 120-foot-high, 80-foot-wide removable fish weir was transported by two tugboats and two barges up the Columbia River, from Portland to the Lower Monumental Dam on the Snake River. In addition to the transportation triumph, this was a noteworthy accomplishment in environmental science. The massive weir, after it is attached to the dam in the next few days by diving specialists, will enable migrating salmon and steelhead to more easily answer their instincts and move downstream hundreds of miles to the ocean. According to the Walla Walla Union-Bulletin, this year's fish weir arrived at Lower Monumental Dam on Tuesday, ahead of schedule. The fish weir technology allows migrating fish to pass more gradually through the dam, starting at a higher level, 10-13 feet below the surface instead of having to dive 50-60 feet down spillways to find a way downstream. According to the U.S. Army Corps of Engineers, similar weirs at the Lower Granite and Ice Harbor dams on the Snake River have allowed the migrating fish to achieve survival rates of higher than 96 percent. That's because the deep-water threats of pressure changes and rapid acceleration are lessened or removed by installing the huge steel contraptions. Think of the fish weir as a water slide for smolts. This relatively new technology, however, cannot be expected to resolve the debate about whether the four Snake River dams should be breached, as many environmentalists have argued. Originally, The Columbian endorsed such a strategy for salmon survival, but we acknowledge that dam-breaching has drawn little support among elected officials. And for now, while the debate rages on, the scientific advancement represented by removable fish weirs is at least a step toward enhancing fish migration. Clark County residents might recall a similar massive fish weir built in 2004 at the Thompson Metal Fab plant in Vancouver on the Columbia River. This year's fish weir - fabricated by Oregon Iron Works in Portland and loaded upon two grain barges at Swan Island - is even bigger. It's the third of four planned for the Snake River. 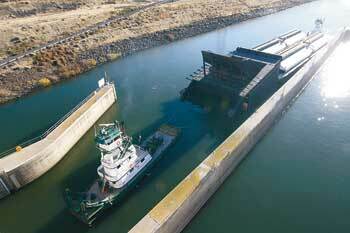 Farthest upstream, a removable fish weir was installed in 2001 at the Lower Granite Dam near the Idaho border. Then in 2005 one was attached to the Ice Harbor Dam, just east of Pasco and the farthest downstream of the four Snake River dams. The fourth and final weir is scheduled for installation at Little Goose Dam in two years. The fish weirs are designed so that they can be moved to different levels, depending on seasonal factors such as fish migratory habits and any possible need to increase flow during high water levels. Balancing the benefits of Northwest dams with the negative environmental impacts of such structures is a tricky, probably impossible, task. Meanwhile, science can be used to answer both demands.